Yellapur Trek is an experience you should not miss. Yellapur is a small town amidst the Western Ghats situated in the Uttar Kannada district of Karnataka. The villages surrounding it are known for their arecanut production and paddy fields. Composed of hills, valleys, and waterfalls, a trek around this region is a complete package of natural beauty. One of the striking stories of Yellapur is that it housed an African tribe for many decades. Home to the scenic valley, gorgeous sunsets and fresh waterfalls, the trek is quite an adventure in itself. The trek is a tad different from the rest as it is mostly around the waterfalls. There are numerous ways of accessing the Yellapur trek. However, the most common ones are that of Magod and Sathodi Falls. Besides trekking to these two falls, you can tread the trails to Kavadi Kere Lake. It is enroute to Magod Falls right in the middle of an evergreen forest. Book a tour in advance or chat up with the locals to finalize a route. 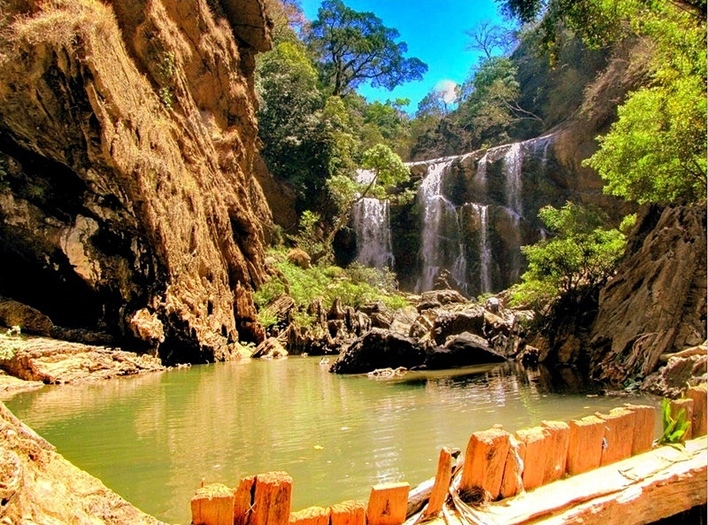 Choose from Vibhuti Falls, Unchalli Falls and the area surrounding the Maskatti Rock Formation. Waterfalls: A visit to the small town is incomplete without checking out the surrounding waterfalls like Sathodi Falls and Magod Falls. While the former lies closer to Hubli, the latter lies closer to Magodu village. These waterfalls witness a lot of tourists; however, monsoons are not the best time to visit them. You could also check out Lalguli Falls that are about 15 kilometres from the Yellapur area. Hill climbing: Climb the honey stone hill or Jenukallu Gudda offering panoramic views of the scenery around. It lies 17 kilometres off Yellapur and offers beautiful sunset views. You can see the Bedti River running across the hill from Magod Falls before it joins the Arabian Sea. Temples: One of the most famous temples is the one at Kavadi Kere Lake dedicated to Goddess Durga, called the Kavadi Kere Durga Temple. Besides this, there is the Sri Siddivinayaka Temple at Chandaguli, about 18 kilometres from Yellapur. The nearest airport to Yellapur is Hubli Airport, about 78 kilometres away, while Kempegowda International Airport of Bangalore is about 444 kilometres away. The closest train station is Hubli Railway Station. If you’re boarding a bus, take one to Hubli, which lies close to Yellapur and is well-connected to all cities. From there, hitch a local bus ride to Yellapur.